Gumball machines caught my attention at an early age when my big brother had one on his dresser. I remember it being very big, and I couldn’t reach it because I was very small, but I liked to look at it. 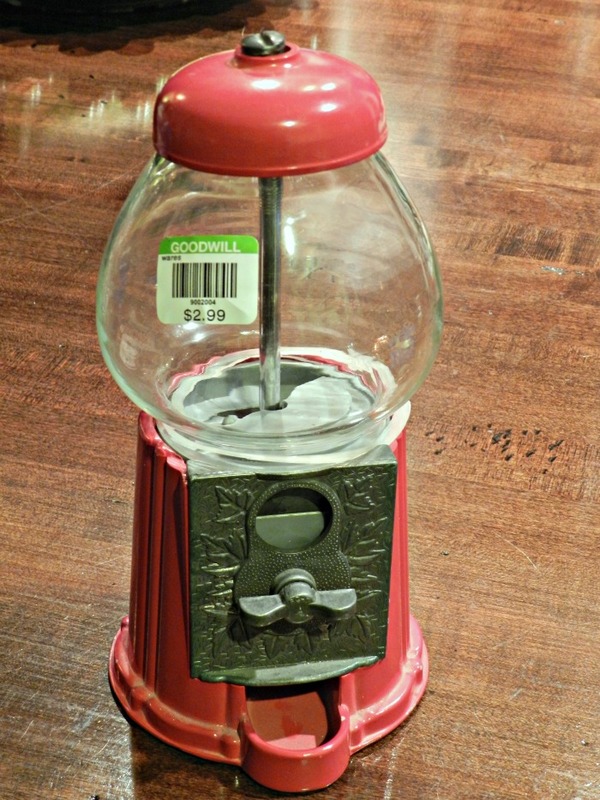 Today, I often wonder what happened to that big red authentic gumball dispenser that even had a metal key to it. As we grew older I surprised my brother, Bobby, with a new one for Christmas for his apartment. 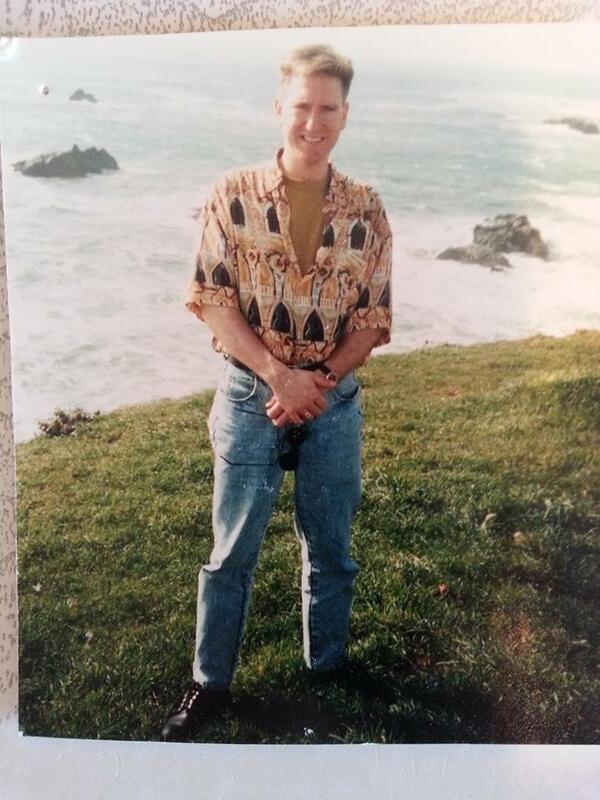 When Bobby passed in 1995, I inherited the gumball machine I had given him. Unfortunately, it was broken and beat up pretty badly from the trip from the West coast, so, I didn’t keep it. I still hold my love for gumball machines, and of course think of my only brother when I see one. 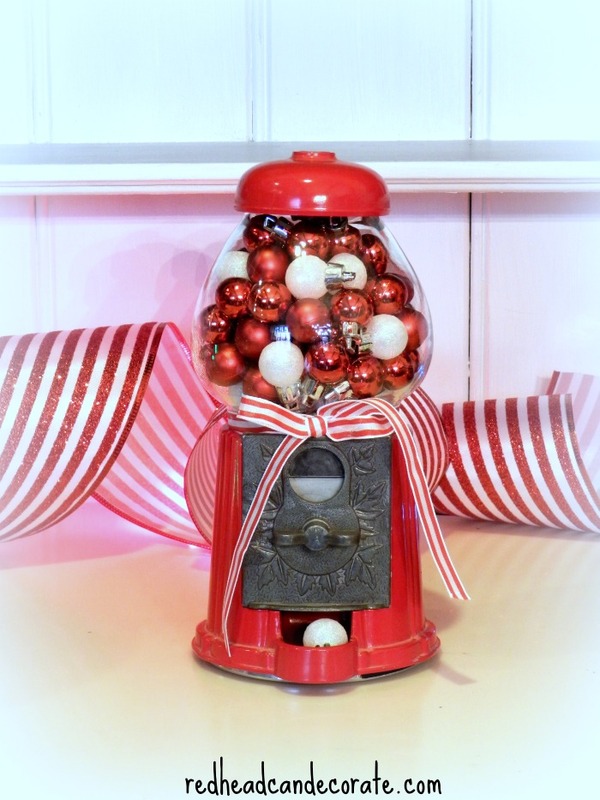 Now you know why I made this “Christmas Gumball Machine”…I hope you enjoy the idea. I came across this little gumball machine at Goodwill a few months ago. I originally thought it would make a super cute Christmas scene globe. Then I found these cute little red & white ornaments and the idea struck (see where to buy below). I cleaned up the thrifty gumball machine easily and filled it up with the ornaments by unscrewing the top (be sure to let children know that this is not a real “gumball” machine). Then I tied a ribbon around it to finish it off and create a Christmas vibe. I looked around the house to find a perfect spot for it and found many. I added one ornament in the bottom opening just for fun. It’s very whimsical looking with my other colorful and fun decor, don’t you think? Loving these bright fun colors instead of all the WHITE we have been seeing for years. Here’s another idea using a full sized gumball machine. 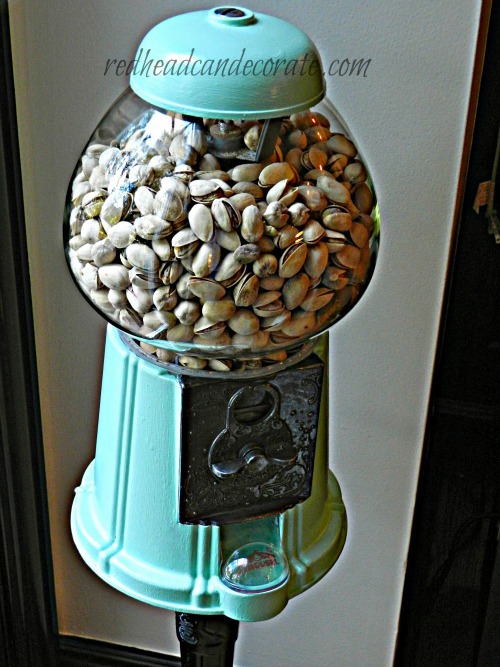 Just paint it pistachio green and fill it up with pistachios instead of gumballs. It totally works and would be great for a party. Just be sure to have a jar for pennies and a jar for empty nut shells. ps, Mom loves it too. 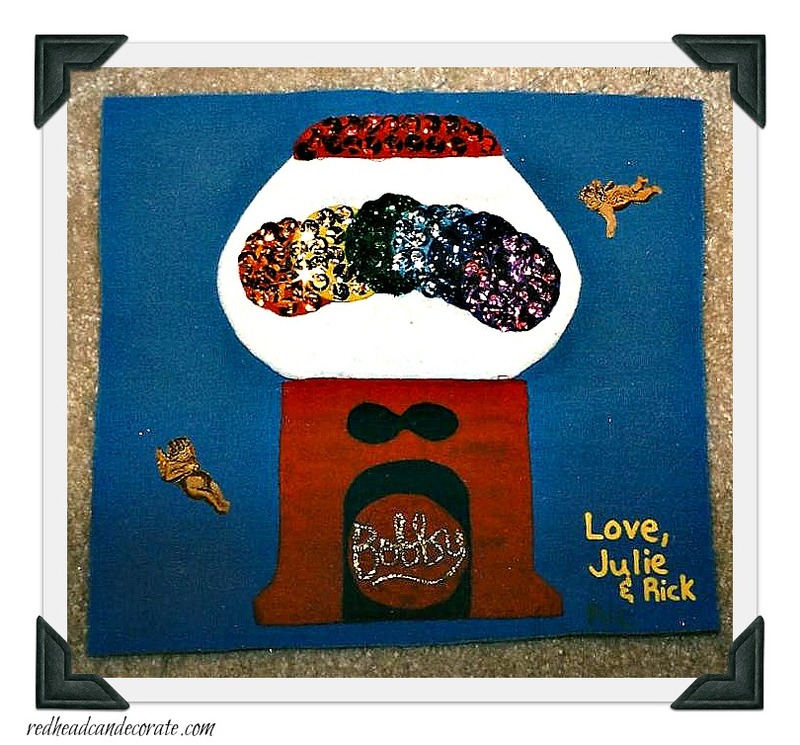 How wonderful you made that very special quilt block for your brother. So sorry he passed, hard huh. Our grandson died June 8, 2016 from recurring testicular cancer, he was 22, I think of him every day and miss him terribly. Love your gumball machines, not to be found in our neck of woods but maybe haven’t looked hard enuf. Just not like KY and MT where supplies of special vintage items were more plentiful and affordable. Love how you gussied up machine for holidays, so pretty with little ornaments. Can do so much with one. What a creative and amazing idea, also such a lovely tribute to your brother, Bobby. Wishing you and your family a happy holiday season. Always love seeing your ideas. What a cute, clever way to honor your brother. I bet many of us have unusual traditions to honor our loved ones. 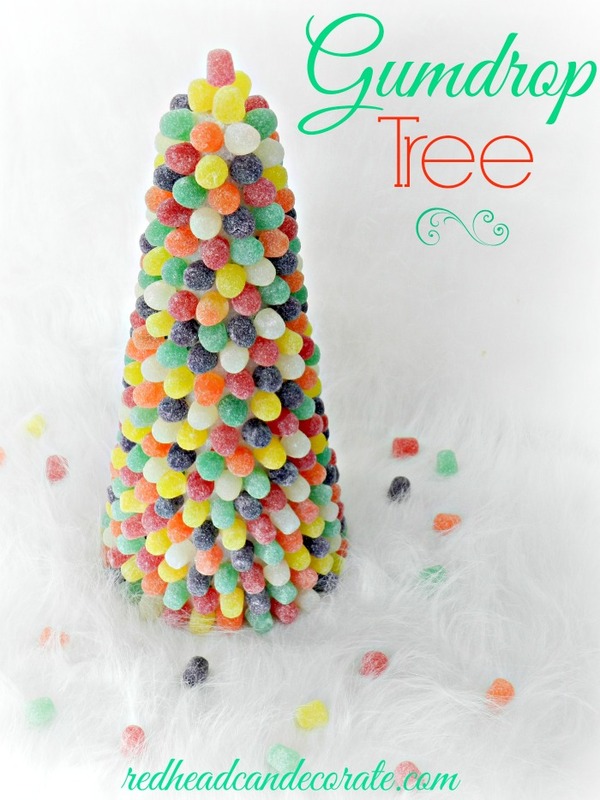 Wondering how you made the ornament tree. Have you done a blog on that? Thanks for your reply, Julie. I bought a huge popcorn tin filled with ornaments for $4 at an estate sale and would like to try making a tree and a wreath with them. 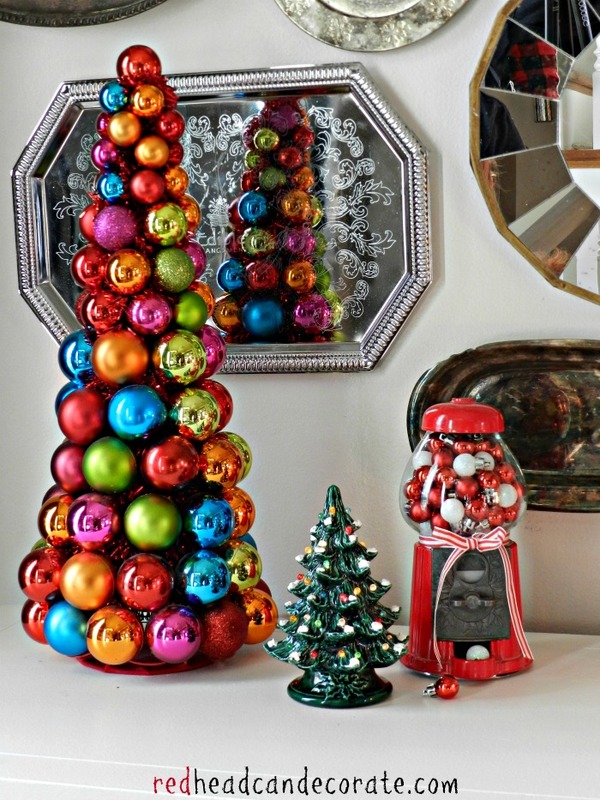 Hey, Redhead…love your gum ball idea…I found one several years ago at Goodwill and love it to pieces…it’s a full one. 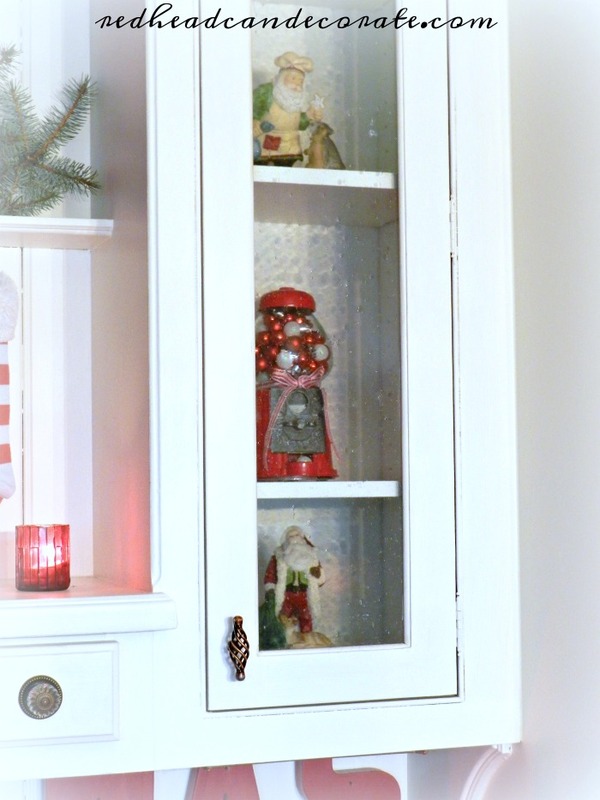 I keep gumballs in it for my grands and great grands so won’t put the ornaments in it but you can be sure it will sport a red and white ribbon…..thanks for the idea. Your quilt is lovely. What it stands for now is priceless memories like your gumball machine. Have a wonderful holiday season full of memories that fill your heart. I will be remembering my two sons. Love the gumball idea. I’ve passed them up at yard sales because I can’t think outside the box like you! 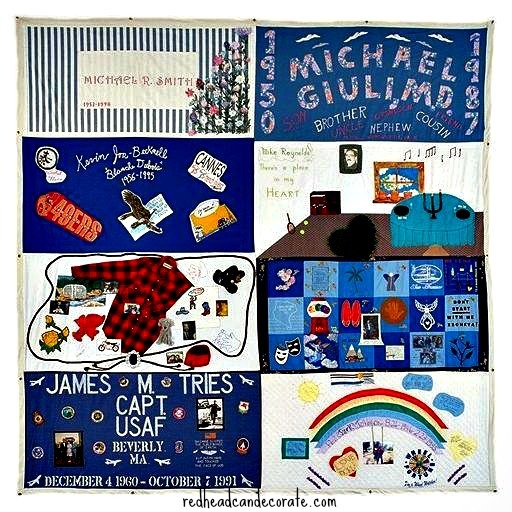 Your quilt piece is priceless too. I love the many things you did with your gumball machine. Nice ideas. I made a dollar tree one Christmas and gave it to my mom as a Xmas gift. She loved it! It became the talk of that Christmas. Thanks for sharing.